Notice to the speaking industry — Gary Vaynerchuk is in business to disrupt it. Fresh off the release of his "Gary Vee 003 Clouds & Dirt" sneaker, a collaboration with K-Swiss, five-time New York Times bestselling author and entrepreneur Vaynerchuk recently announced via Twitter his newest venture in VaynerSpeakers. 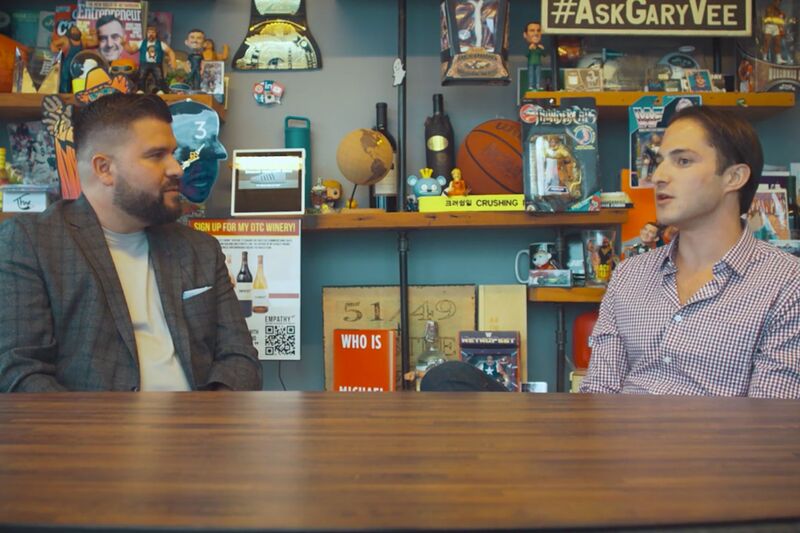 In the video above, I sat down with VaynerSpeakers CEO Zach Nadler for an exclusive interview on the vision of VaynerSpeakers including who they’re interested in representing and what potential clients can do to get on their radar. Ironically, the origins of VaynerSpeakers began about 10 years ago when Nadler (then at Creative Artists Agency) worked with a someone he called a "developmental talent" — none other than Vaynerchuk. Today, at the helm of VaynerSpeakers, Nadler is looking to discover new, young, up-and-coming talent while building a world-class roster of speakers and subject matter experts, which already includes Tom Bilyeu and other yet to be named clients. As with any profession, experience comes with practice. Whether you’re speaking in a boardroom and presenting to a handful of colleagues or presenting on stages to hundreds or thousands of industry professionals, public speaking can be terrifying for even the most confident individuals. Before approaching a speaker’s bureau about representation or pitching yourself to a conference as its keynote, try speaking to smaller audiences within your community (e.g., Chamber of Commerce meetings, local meetups, etc.). Also, as you will discover, there’s a difference between moderating a panel, being a panelist, and leading a breakout session or workshop at a conference. However, they are all excellent places to start to build up your self-confidence and experience. Throughout our interview, Nadler mentioned the importance of one’s background as it pertains to being able to connect and resonate with the audience. While being a subject matter expert in your field is critical to one’s success, Nadler suggests that leading in with your story and not where you’ve spoken becomes a differentiator for speakers. While there are thousands of other professionals who are qualified to teach, what makes you different from the rest and what is your story? Think about this before your next pitch. 3. Have a speaker reel. A quick YouTube search for "social media keynote speaker" reveals nearly a dozen videos of myself speaking at various industry conferences. Strong SEO via YouTube has helped me grow a six-figure speaking business because my videos are front and center to conference organizers and booking agents whenever they run a Google or YouTube search for a "social media keynote speaker." Even if you pay someone to film your talk professionally, the value of having your content on YouTube is worth the investment. By having content of you speaking on YouTube, a conference organizer can immediately determine if you’re a fit for his or her audience by seeing the way that you carry and present yourself as well as your subject matter. 4. Speak at large industry events. Do you have to speak at mega-conferences such as SXSW, Web Summit, Social Media Marketing World or your industry’s equivalent to make it as a speaker? Nadler says no, however, it doesn’t hurt either to have conferences which are recognized globally on your resume either. Although it’s much harder to get invited to speak at larger events such as the ones aforementioned, once you’re able to say that you’ve spoken there it instantly offers credibility to other, lesser-known conferences. At a minimum, it also validates that you have some expertise. 5. Build your personal brand. To be candid, I highly doubt that if I walked in off the street, I would have been able to land an interview on the spot with Nadler or anyone in his position without having a personal brand. Personal branding plays a significant role in how you’re viewed by others which is why there’s so much content online these days designed to help you build your brand. The same rules apply in the speaking industry. Conference organizers are in business to sell tickets, which is why they’re more likely to put someone on stage who perceivably is a draw. Think about this for a moment: If you’re an author with no social media presence, you depend on word of mouth marketing to become known. Whereas if you have a visible presence on YouTube creating tutorials from your bedroom and 100,000-plus subscribers, now you have an audience of buyers to go with the portfolio of your speaking pedigree. Do you aim to pursue a career in public speaking? Let’s connect on social media and discuss. Watch more videos from Carlos Gil on his YouTube channel. Follow Carlos Gil on Instagram @CarlosGil83.